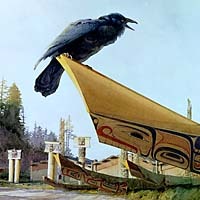 The Haida were divided into two social groups, or moieties, called Raven and Eagle. The Raven moiety was subdivided into twenty-two lineages, or families, and the Eagle moiety into into twenty-three; the lineages were not grouped into clans. According to John R. Swanton, "in olden times each town was inhabited by one family only," but by historic times, all villages contained representatives of several lineages and most contained members of both moieties. Marriages had to take place between Eagles and Ravens, rather than those who belonged to the same moiety, and children became members of the same moiety as their mother. Each lineage provided its members with entitlement to a range of economic resources such as fishing spots, hunting or collecting areas, and house sites. Other prerogatives included rights to a wealth of myths and legends, dances, songs and musical compositions. Names were a highly coveted lineage property and were bestowed to mark different stages of people's lives. Names were also given to important material belongings such as fish traps, houses, canoes, feast dishes and even feast spoons. Face painting and tattoo designs were also lineage property, as were all crests, of which Swanton lists over seventy. Each household, whose average size was around thirty to forty people (consisting of about ten closely related nuclear families of a lineage), was headed by a chief. The houses of powerful chiefs were large and could contain up to a hundred individuals, including slaves. Each lineage also recognized the authority of a chief who could act as a war chief in times of conflict. The town chief was the head of the most wealthy or populous lineage in a village, but changed from time to time in accordance with the general fortunes of the lineage or because of the respect commanded by a certain chief. During the last century, for instance, there was intense rivalry between Chief Ninsingwas and Chief Skidegate. 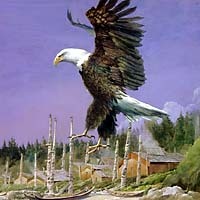 According to Newton H. Chittenden, a surveyor for the British Columbia provincial government, "They quarrelled bitterly over their rank for a long time, Ning-Ging-Wash, by means of his more liberal potlatches finally prevailing, but not until two of their adherents had been killed." Chiefly rank was passed down by inheritance through the matrilineal line, usually to a chief's oldest sister's son. Inherited positions determined the order in which chiefs or people of high rank were seated at potlatches and feasts. Those who had not had potlatches given for them, or who did not own houses or major property, were considered commoners. The Haida also owned slaves, who were war captives or the children of captives, often taken from neighbouring tribes on Vancouver Island or the mainland. The potlatch was the most important Haida ceremony and accompanied the progress of high-ranking people through the social order to mark the giving of names, marriages and deaths. Years of preparation were required to amass the food to feed invited guests and the wealth to distribute gifts to pay for the witnessing of events. The building of a house and the raising of a frontal pole usually called for the major potlatch any chief would give in his lifetime.